Ancient Sea Fossil Found On NASA Mars Website Front Page, And They Didn’t See it! LOL, Nov 2018, UFO Sighting News. 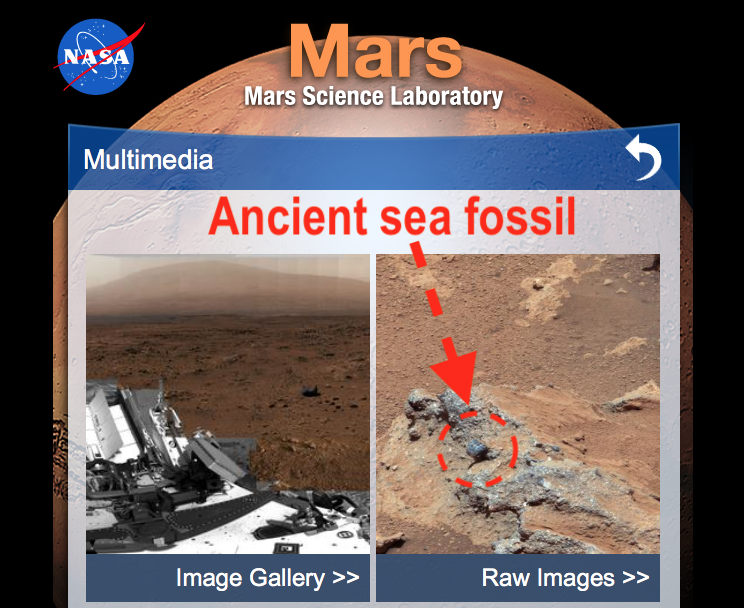 While looking at the front page of the Mars Science Laboratory website, I noticed that they placed a photo with a huge black fossil right on the freaking front page! How could anyone who has any experience at ancient fossils and artifacts have even possibly have missed that? NASA really doesn’t care about finding life, or proving that life once existed on other planets. They only want to drop feed the public boring science facts to satisfy the publics curiosity. Its called the trickle down theory and NASA perfected it. There is no doubt in my mind that this is a ancient fossil. I have searched and found many fossils and ancient indian arrowheads here on earth…I have experience in this area. So, how could NASA not see it?